Finely made bookend replicas of the Cincinnati Union Terminal train station are available. They are not cheap, but are for sale online. The bookends stand 4" high x 6.25" long x 3.25" wide. Made by the well-known ceramic maker, Rookwood pottery, which is also located in Cincinnati, Ohio. Founded in 1880 by Marie Longworth Nichols, Rookwood pottery's initial work demonstrated an Oriental and European influence. Throughout Rookwood's years they mastered such diverse styles as Victorian, art nouveau, arts and crafts, and art deco. 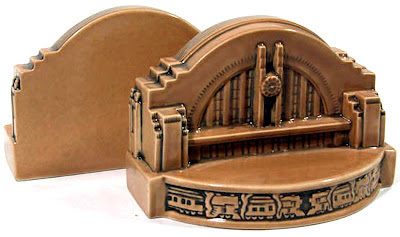 Seems a natural fit that they produce replicas of the stunning art deco style Cincinnati Union Terminal, which now has a new life as the Cincinnati Museum Center. The station opened in 1933 and its rotunda features the largest semi-dome in the western hemisphere, measuring 180 feet wide and 106 feet high.